For my latest project with The Little Paper Tree I decided to make a quick and easy masculine card. Even with changing my plan part way through it took me less than 15 minutes to create this card, and it would be very straight forward to make multiples of it too, so it’s a great one if you need cards in a hurry. I started by cutting a panel of 80lb Neenah Solar White to 3″ by 4 1/4″. 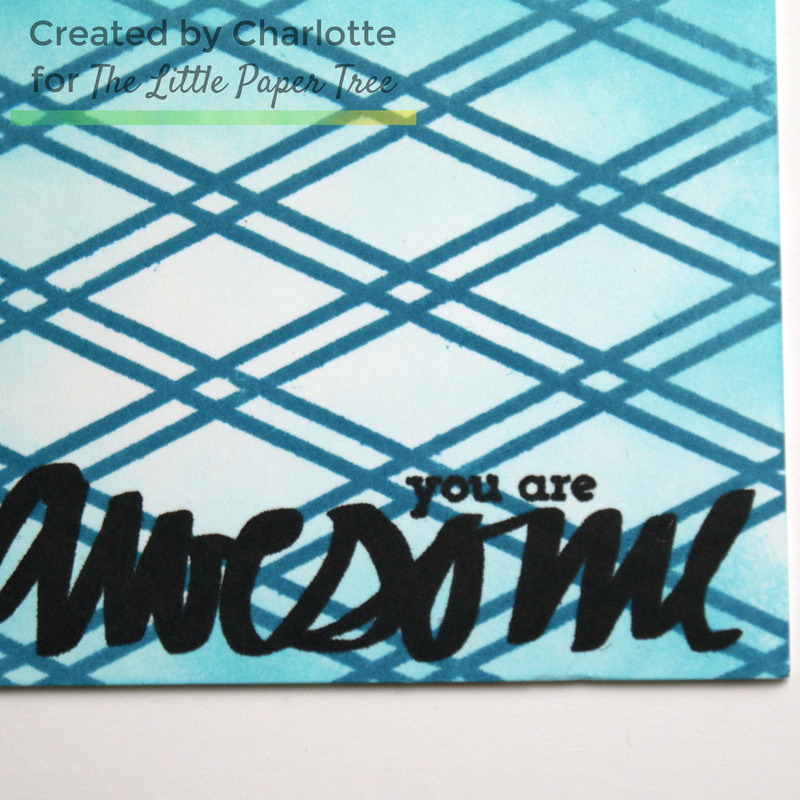 I then placed it into my MISTI and stamped with Catherine Pooler’s BFF Background Stamp and Altenew Dusk ink. After completing my stamping I used the slightly lighter Ocean Waves ink to blend around the outer edges of the panel. Next I added my sentiment. 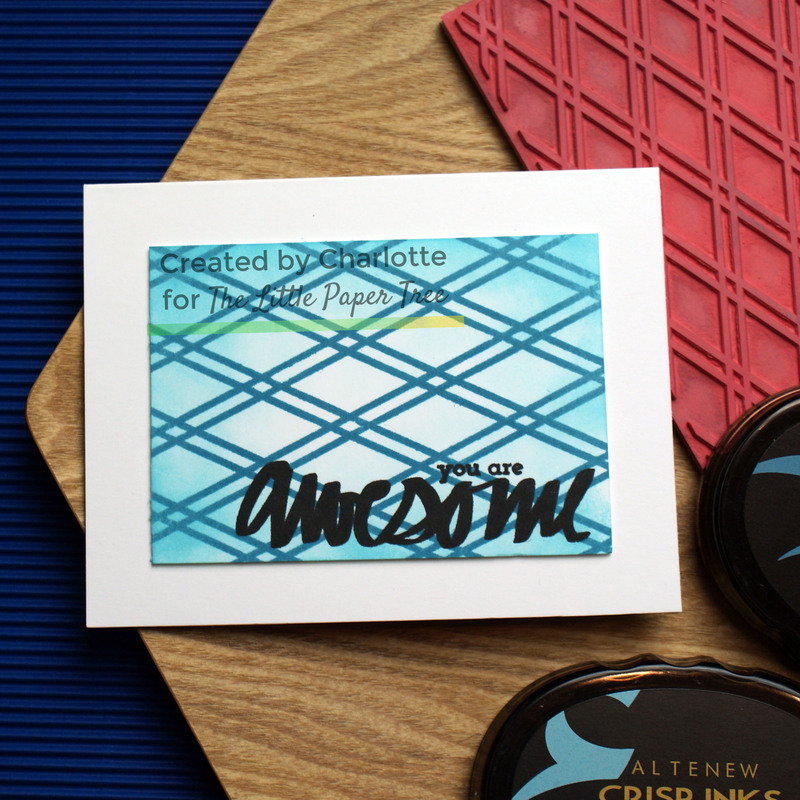 I chose “you are awesome” from Altenew’s Super Script. I stamped it with Jet Black ink onto the lower corner of my panel. All that remained was to add foam tape to the back of my focal panel, and adhere it to my 110lb Neenah Solar White card base. I’m pleased with this card, and I think it’s very versatile. I love that you could easily change up the colours and sentiment to give a different feel to the card without too much extra effort. It would be easy enough to customise it to the recipient by using their favourite colour, or perhaps even two different colours. P.S., use code CHARLOTTE10 when you purchase from The Little Paper Tree to save 10% on your order! Lovely to see you joining in our ‘Make it Masculine’ theme at Allsorts challenege, many thanks. I really like it. So glad you joined us at A2Z Scrapbooking. Great card! Thanks for joining us this week at Polkadoodles Crafting Challenge! Nicely done!! Thanks for linking up to our January challenge gallery at a2z. Thank you so much for entering our challenge at Crafter’s Castle this month….good luck! Thank you soo much for taking part in our “anything goes with optional winter fun” challenge over at Creatalicious & good luck in the draw.